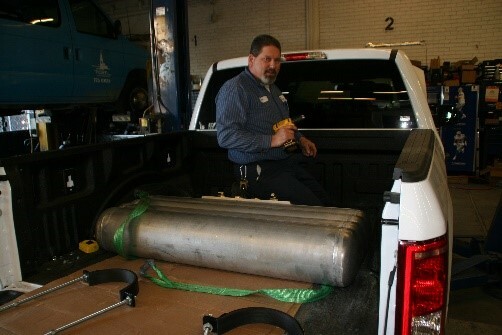 Updated news: Conformable ANG tank in the 2016 ANG F-150: In April of 2016 Ford Motor Company recommended that we purchase a F150 gaseous prepped truck with a 5.0 liter engine and install Cenergy Solutions’ bi-fuel ANG conversion package and ANG conformable tank to prove this technology. 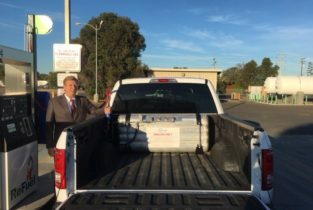 Cenergy Solutions purchased a F150 Supercab 4×4 with a 5.0 liter engine to convert with our ANG conversion system and conformable tank. The conformable ANG tank is a Type 1 DOT complainant aluminum tank that is ASME certified. Cenergy Solutions set the working pressure at a conservative 425 psi. The tank was specifically designed to work with our ANG system. The synthetic activated carbon in the tank came from EnerG2 based out of Seattle. 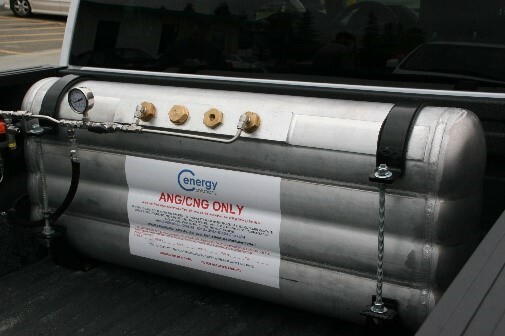 The tank for the F-150 CNG project has two Cenergy Solutions’ patent pending ANG filters. These filters keep the carbon in and let the natural gas out on demand. The tank also is equipped with a Roterex Temperature PRD and an inline PRD from Swagelok. Blackstone, LLC supplied the Fill Regulator that they designed for ANG systems. This Fill Regulator lets you fill up at a fast fill station. The system restricts the flow and turns off at a pre specified pressure. The system is designed to be filled at a slow fill station and a fast fill station. Blackstone will be adding a PRD to this system as a backup if the tank pressure exceeds a predetermined psi. 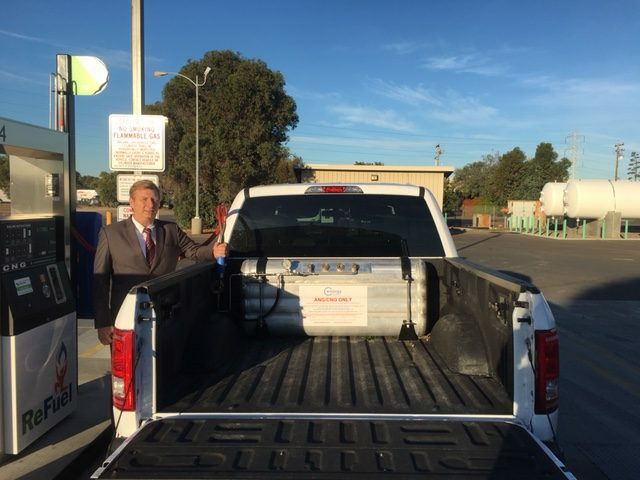 Cenergy Solutions had A-1 Alternative Fuels from Fresno, a Ford QVM install the Cenergy Solutions’ bi-fuel ANG system and conformable tank. 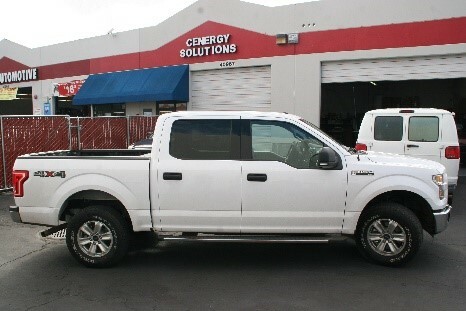 The Cenergy Solutions’ conversion system has been approved by the EPA on 115 different models and it is our plan to get EPA and CARB approvals on this F150 in the near future. The conversion system is calibrated to run at 36 psi works well with an ANG tank. ANG tanks hold a lot of gas at low pressures thus it is important to be able to operate the vehicle at low pressures. The Cenergy Solutions patent pending filters in addition to Blackstone’s regulator under the hood along with the Cenergy Solutions’ bi-fuel ANG conversion system all help to get the flow of natural gas to the engine. The 2016 ANG F-150 was tested with its ANG system and tank. Under load the F-150 performed like it does on gasoline. When the system switched from gasoline to natural gas you could not tell the difference. Under load and running on the ANG system the vehicle ran the gas down to 65 psi in the tank. With further flow modifications we will be able to operate the vehicle under load down to 356 psi.